We’ve got good news and bad news. The good news is that we finally have a new Unshelved collection coming out. At 192+ pages it’s by far the largest collection we’ve ever made, with over two years of strips. You can get a copy by backing our Kickstarter today! 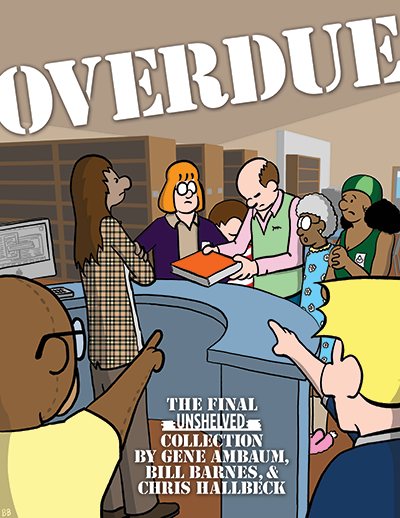 The bad news is that it will be our final Unshelved collection, because after Friday, November 11 we will stop making new Unshelved comic strips. After that we’ll switch to publishing classic Unshelved strips (there are a lot of them!) and we’ll keep our store open as long as it makes sense. We’ve been making Unshelved for almost fifteen years. That’s a long time. When we published our first strip on February 16, 2002 the iPhone was just a glint in Steve Jobs’ eye, Facebook was years away from reuniting anyone with their high school sweetheart, and tweeting was still exclusively for the birds. We had been puttering around for six months with an idea for a comic strip about a library, and began quietly publishing them on the web for our friends and family. We figured we’d do that for a few months, learn from our mistakes, and then start over. But after just a few days Jessamyn West found us, let the library world know, and we went from a few dozen readers to several thousand in the space of a week. There was no possibility of turning back. 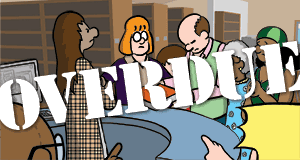 Back then our little comic strip was called Overdue, and that’s what we’ve decided to call our last book. It’s been a madcap journey. After a few years we had enough readers that we both decided to gamble by quitting our day jobs to try doing this cartooning thing full-time. It was harder work than we expected. There were many years when we were on the road, away from our families, for weeks at a time, giving talks and selling our books and merchandise at library conferences and comic conventions. We’re proud of the more than 4500 strips we made, but also the many things we created: Pimp My Bookcart, merit badges for librarians (with a great video), a thumb drive in the shape of a card catalog (with another great video), dozens of t-shirt designs, the library notebook, the library raid jacket, and full-length comic adventures about BEA, an evil bookmobile, and a blackout. We interviewed Nancy Pearl on stage twice, and we've delivered keynotes at more than a hundred events in over 40 states and provinces. Now it’s time to draw this adventure to a close. We’re both ready for new things. Back in April, Bill left to take a break from cartooning, but he’ll return to draw and co-author the last week of strips. Gene isn’t done with libraries and comics yet -- he’s cooking up both a new webcomic and a new book review site we think you’ll like, and he’ll let you know when they're ready for prime time. You can also continue to hire him to speak at your events. Our special thanks to artist extraordinaire Chris Hallbeck, who has been knocking it out of the park for us, along with Willow Payne and John Carvajal who have been drawing fantastic Friday Unshelved Book Club comics. We want to acknowledge our Associate Publisher Angela Moeny, who took on Bill’s other business duties with skill and élan. And no list of Unshelved employees would be complete without a mention of Jana Kincl, our longtime store manager, who shipped approximately nine billion orders for us over the years and always had a smile and an accurate sizing suggestion at the Unshelved booth. And then there’s you. We couldn’t have asked for a more loyal and supportive audience, who have kept the lights on here at Overdue Media HQ by buying stuff, hiring us, and most recently contributing to our Patreon. More importantly you read Unshelved and told your friends about it. Thank you all so much for helping make our dreams come true. You’re the best. It’s not quite time to say goodbye -- there’s still one more month of new Unshelved strips, and we’ll have more to say between now and then -- but we wanted to give you some time to get adjusted to the idea (we’re still getting used to it ourselves).